If you use a Home Theater PC to run your living room entertainment you no doubt are focused on keeping the PC-part of the HTPC behind the scenes. Despite all your efforts to avoid the dreaded computer operating system rearing its ugly head, on occasion you’ll no doubt experience a program crashing now and then. My goal today is to show you an easy way to gracefully (as gracefully as possible at least) recover from an application crash in XP or Windows Server 2003. There are two simple steps to the process – each of the steps address the crash itself and automatically restarting the application from that crash. First, it tells the user that they are using a crash-prone, buggy HTPC. WAF (Wife Acceptance Factor) and user acceptance immediately goes through the floor. Worse then the above, this message requires you to pull out either a mouse or keyboard to continue. To maintain the premise that this is a 10-foot interface, we DO NOT want to use anything other than a remote control unless it’s for a cool, extra feature like web browsing on your TV right? Finally the error message does absolutely nothing for the user. It is one of those things people hate about the Microsoft OS and we want to eliminate it. 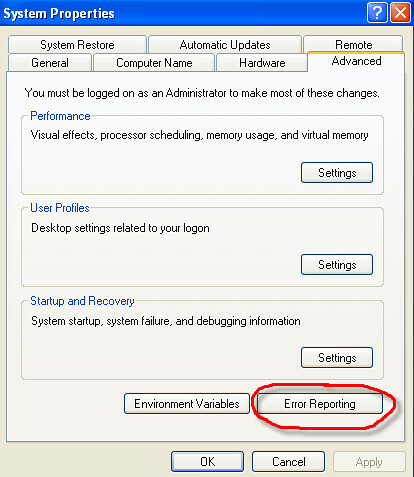 SO HOW DO YOU DISABLE THE WINDOWS ERROR REPORTING MESSAGE? 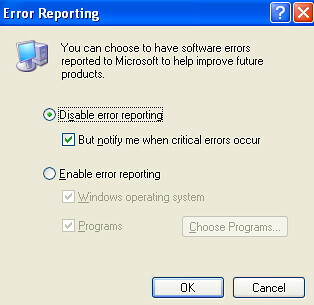 Select the "Disable Error Reporting" radio box (I leave the "But notify me when Critical Errors Occur" message selected. Some applications may restart on their own after an application crash, but others might not. If that application happens to be integral to your HTPC experience, it becomes more then an annoyance. Now that we have the windows error message disabled in step one, we can focus on having the app automatically restart. 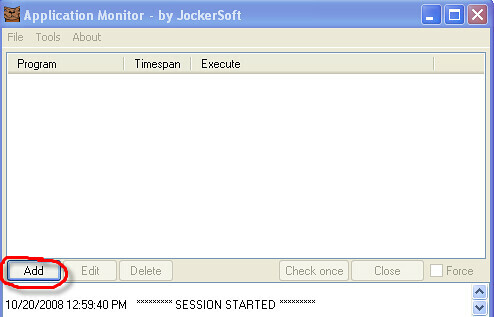 I ran across a nice freeware utility app via MyDigitalLife called “Application Monitor” that watches for any programs of your choosing to monitor for a crash and even restarts the application as soon as a system crash is detected. Enter the program name and browse to the file location. You can change the frequency that the program checks for the file to be running in the “check every” box. The default frequency is 2 minutes with the minimum being 30 seconds. If you want to monitor that program from afar, you can select Tools>Settings and insert your email address and get an auto e-mail notification any time there is an error. 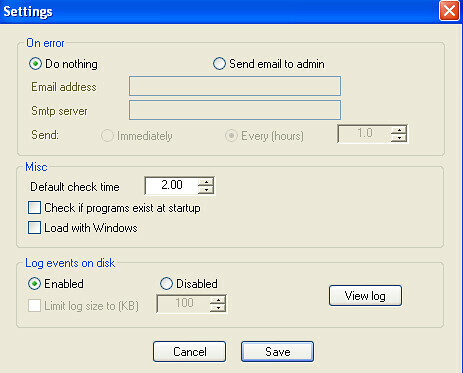 In addition, all events are output to a log file for later review. 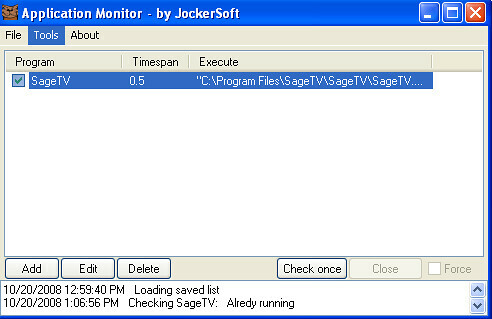 The Application Monitor makes a very nice troubleshooting program for programs that are crashing on occasion. I would also consider using it for any HTPC-related program, web or mail server or other client applications. My final method to handle the restart after crashing is specifically meant for HTPC users. If you HTPC software crashes and you have remote control in hand, make sure you have a command mapped using girder or eventghost to that HTPC program. I’ve done this with BeyondTV and SageTV for those moments when I needed to start the HTPC front-end program with a press of the remote. Works every time.